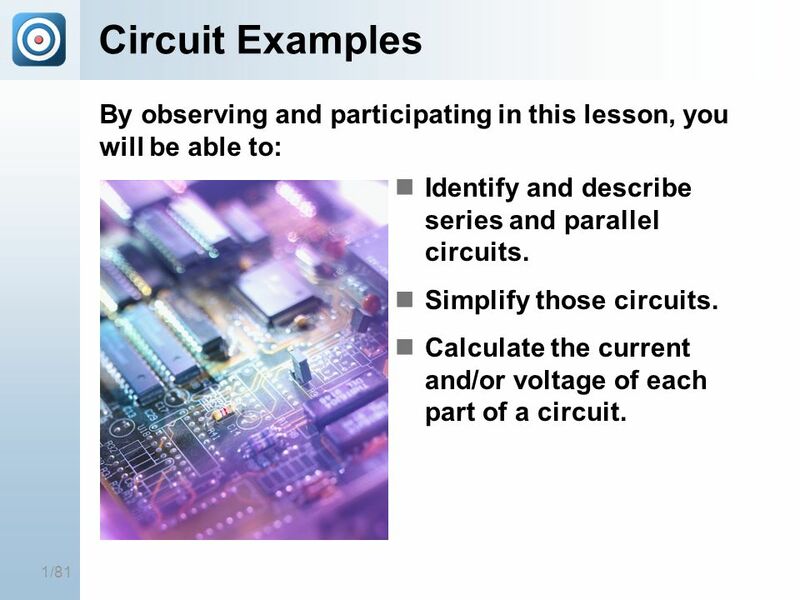 1 25-Mar-17 Circuit Examples [Title of the course] By observing and participating in this lesson, you will be able to: Identify and describe series and parallel circuits. Simplify those circuits. Calculate the current and/or voltage of each part of a circuit. By completing this core tutorial you will understand and utilize Ohms law, calculate electric power, describe the characteristics of series and parallel circuits, calculate various electric quantities in circuits, and learn the basic concepts pertaining to Kirchhoff’s laws. Copyright © NameOfTheOrganization. All rights reserved. 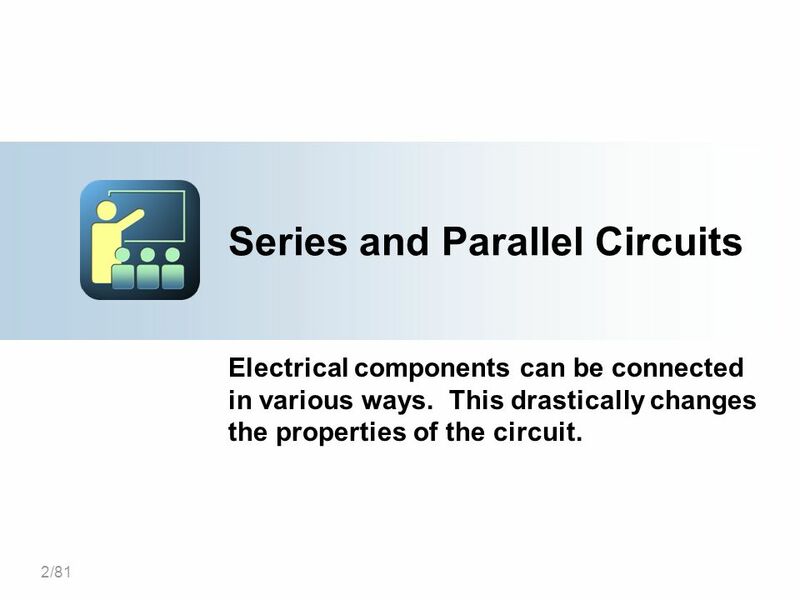 25-Mar-17 [Title of the course] Series and Parallel Circuits Electrical components can be connected in various ways. This drastically changes the properties of the circuit. Electrical components can be connects in various ways. This drastically changes the properties of the circuit. Copyright © NameOfTheOrganization. All rights reserved. 3 25-Mar-17 Series Circuits [Title of the course] One simple way to arrange components in an electrical circuit is to create one large continuous loop with the components: switch 2 batteries Light bulb One simple way to arrange components in an electrical circuit is to create one large continuous loop with the components. Here some batteries are connected to a switch, a light bulb, and a resistor. All are connected in one series loop. resistor This is similar to a TV series where one episode follows another. Copyright © NameOfTheOrganization. All rights reserved. 4 25-Mar-17 Parallel Circuits [Title of the course] Another way to connect a circuit is in parallel. In this arrangement, each component is connected separately in its own “loop”. 2 batteries Another way to connect a circuit is in parallel. In this arrangement, each component is connected separately in its own “loop”. Here three resistors are all connected in parallel. The items do not literally need to be parallel geometrically speaking. They simply must have their own loop or connection. 3 resistors in parallel Copyright © NameOfTheOrganization. All rights reserved. 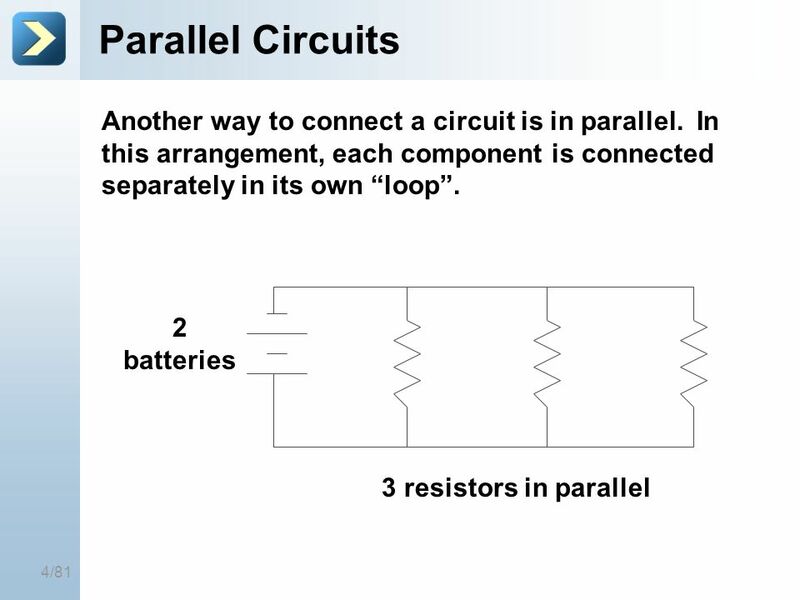 25-Mar-17 Resistors in Parallel [Title of the course] To find the equivalent resistance of resistors added in parallel: To fin the parallel or total resistance for resistors connected in parallel, the formula is a bit different. One over the combined resistance is equal to one divided by the first resistor plus one divided by the second resistor, etc. Parallel or total combined resistance, Ω Individual resistors, Ω Copyright © NameOfTheOrganization. All rights reserved. 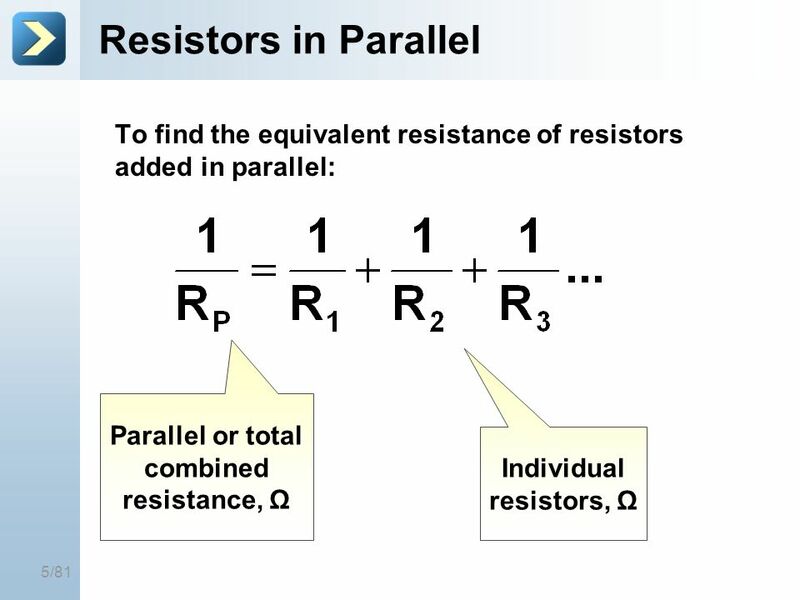 25-Mar-17 Parallel Resistor Example [Title of the course] Calculate the total effective resistance of two 10 Ohm resistors connected in parallel. 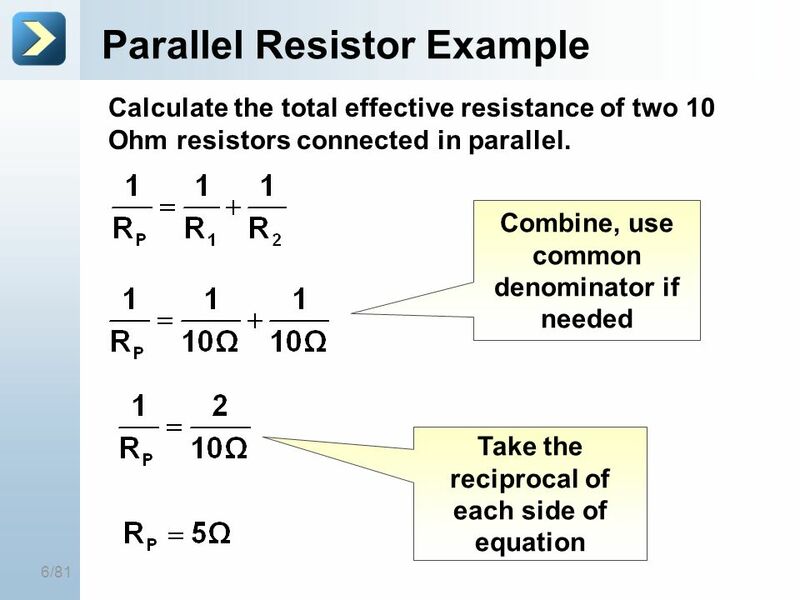 Combine, use common denominator if needed Calculate the total effective resistance of two 10 Ohm resistors connected in parallel. Use the parallel resistor formula. Find a common denominator if needed, add, and take the reciprocal of each side to finally arrive at the parallel resistance of the combination. Take the reciprocal of each side of equation Copyright © NameOfTheOrganization. All rights reserved. 5 Ohms. Notice that the total overall resistance is lower than either one of them individually! This occurs because there are multiple paths for the electrons to take, lowering their resistance. 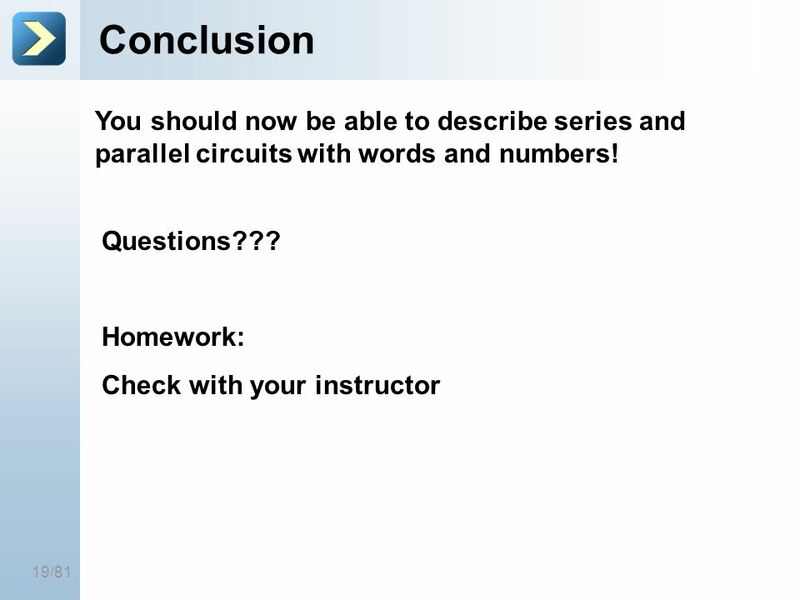 8 25-Mar-17 [Title of the course] Circuit Problems This section will detail how to calculate the various electrical quantities in a circuit. 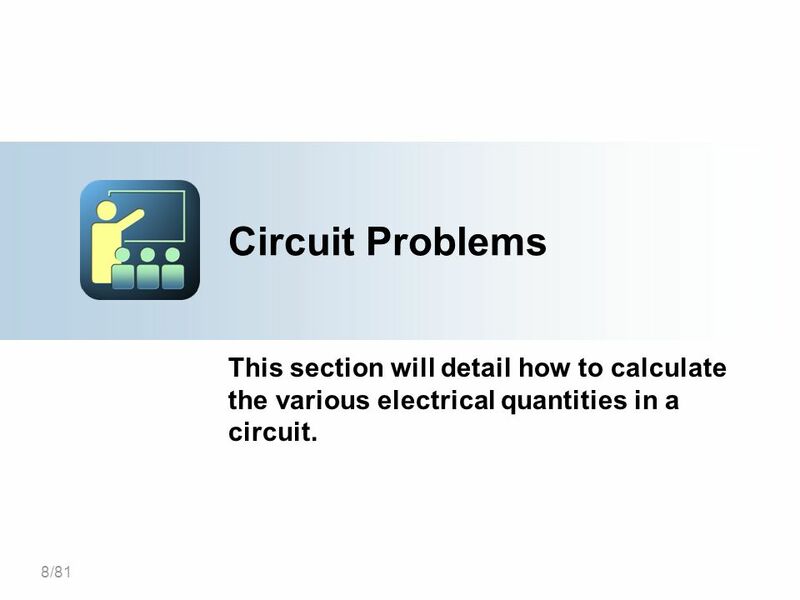 This section will detail how to calculate the various electrical quantities in a circuit. Copyright © NameOfTheOrganization. All rights reserved. 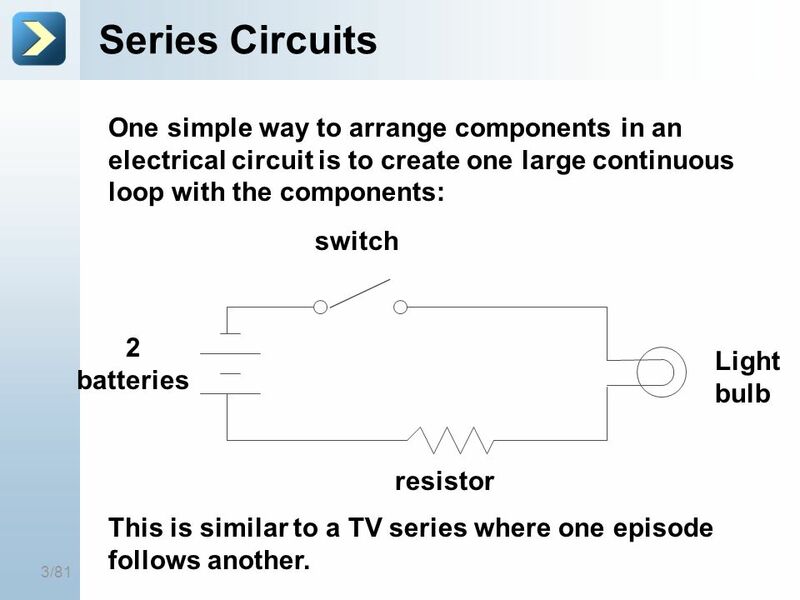 9 25-Mar-17 Series Circuit [Title of the course] Calculate the current and electric potential difference for each component of the circuit shown. 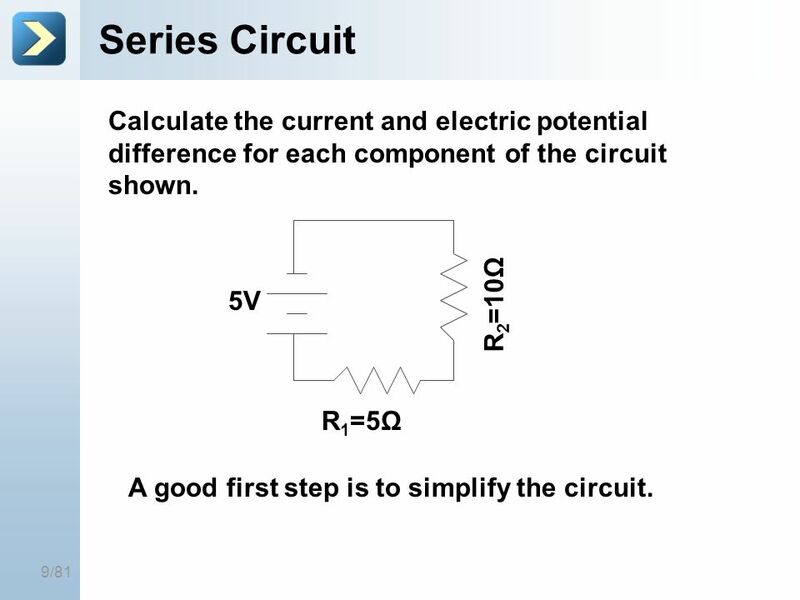 R2=10Ω R1=5Ω 5V Calculate the current and electric potential difference for each component of the circuit shown. This means find the I and V for each resistor. A good first step is to simplify the circuit. A good first step is to simplify the circuit. Copyright © NameOfTheOrganization. All rights reserved. 25-Mar-17 Circuit Simplification [Title of the course] Because this is a series circuit, to combine the resistors and simplify the circuit, they are merely added together. R2=10Ω R1=5Ω 5V 5V Rs=15Ω Because this is a series circuit, to combine the resistors and simplify the circuit, they are merely added together. The total resistance of the circuit is 15 Ohms, this will be used in the next step. Copyright © NameOfTheOrganization. All rights reserved. 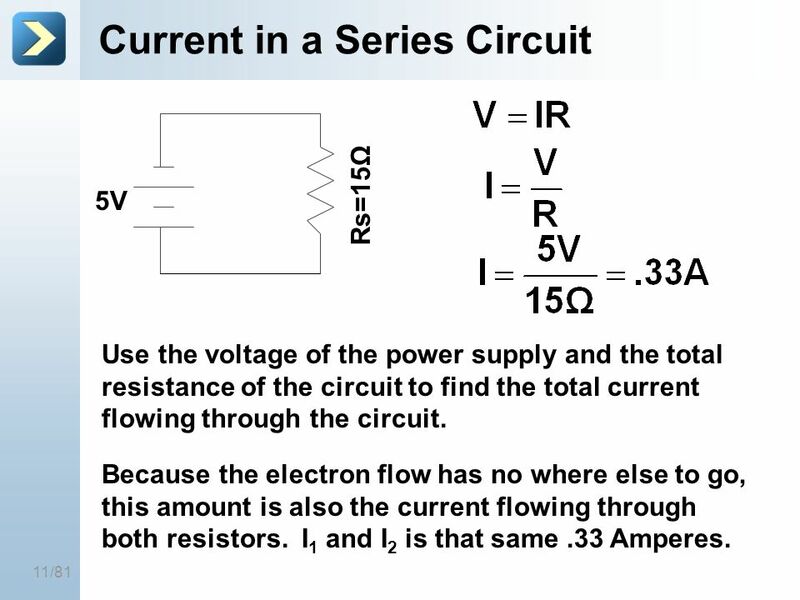 25-Mar-17 5V Rs=15Ω Current in a Series Circuit [Title of the course] Use the voltage of the power supply and the total resistance of the circuit to find the total current flowing through the circuit. Using Ohm’s law and the total voltage and resistance of the circuit, find the total current flowing through the circuit. Since this is a simple series circuit, with only one way for the current to flow, this amount also represents the current flowing through resistor number 1 and 2. Because the electron flow has no where else to go, this amount is also the current flowing through both resistors. I1 and I2 is that same .33 Amperes. Copyright © NameOfTheOrganization. All rights reserved. 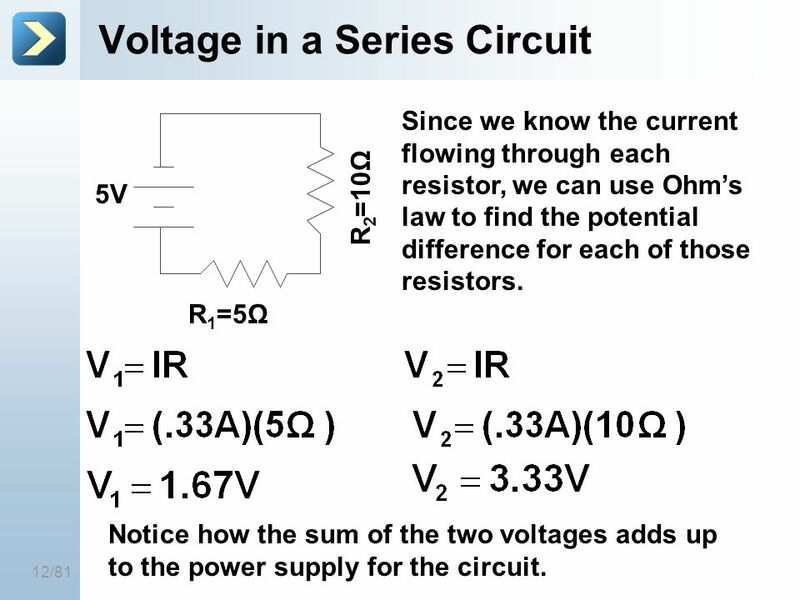 25-Mar-17 R2=10Ω R1=5Ω 5V Voltage in a Series Circuit [Title of the course] Since we know the current flowing through each resistor, we can use Ohm’s law to find the potential difference for each of those resistors. We have the current flowing through the two resistors from the previous step. Since the resistance values are given in the problem, we can use ohms law to find the voltage drops, or electric potential difference. Notice how the sum of those two voltages adds up to the power supply from the circuit. Notice how the sum of the two voltages adds up to the power supply for the circuit. Copyright © NameOfTheOrganization. All rights reserved. 13 25-Mar-17 Parallel Circuit [Title of the course] Calculate the current and electric potential difference for each component of the circuit shown. 5V R1=5Ω R2=10Ω Notice how this parallel circuit contains the exact same components as the series circuit, they are just arranged differently. Again, a good first step is to simplify the circuit. Copyright © NameOfTheOrganization. All rights reserved. 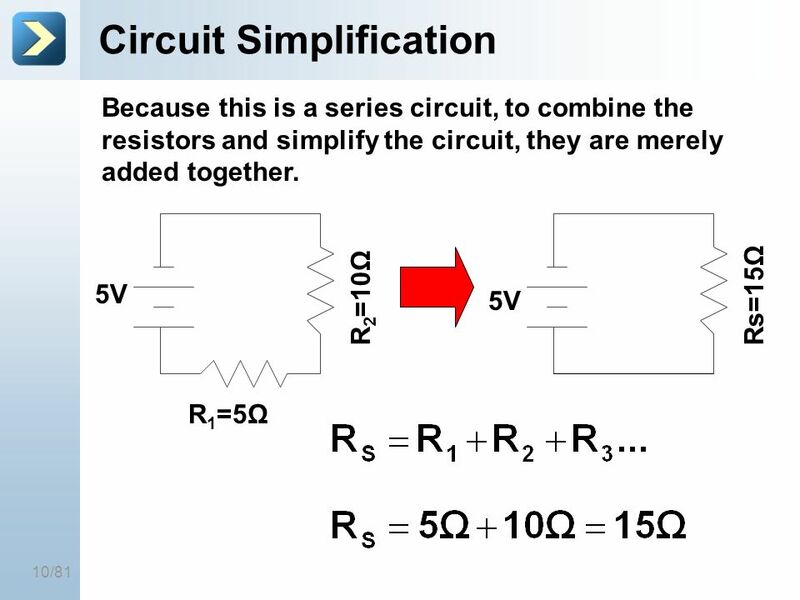 25-Mar-17 Circuit Simplification [Title of the course] 5V R1=5Ω R2=10Ω Use the formula to combine resistors in parallel. If using fractions, find a common denominator and combine. Be sure to take the reciprocal at the end to get the parallel resistance. 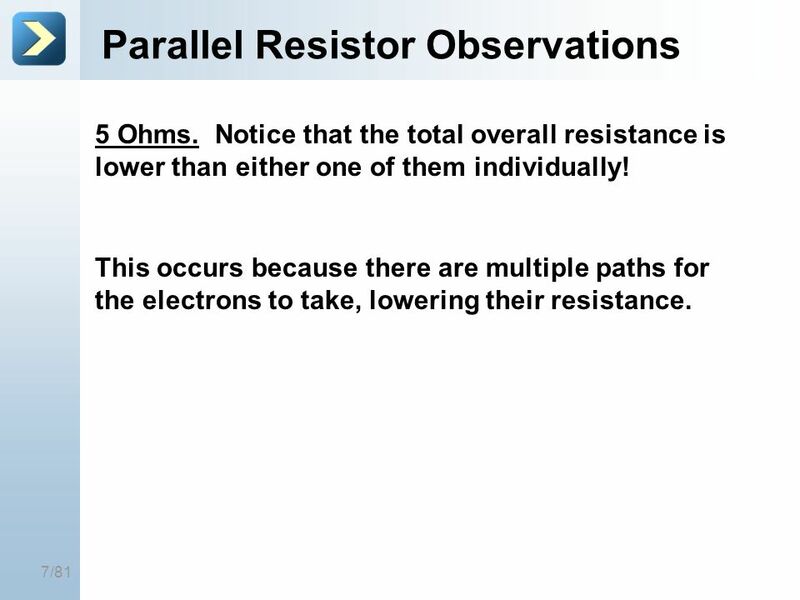 Notice this combination of resistors in parallel yield a resistance that is less than either one of them individually! 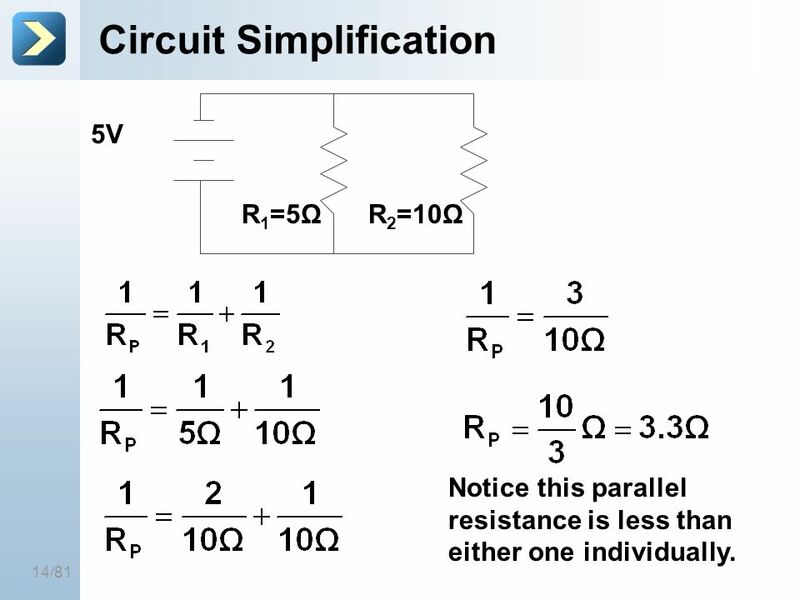 Notice this parallel resistance is less than either one individually. Copyright © NameOfTheOrganization. All rights reserved. 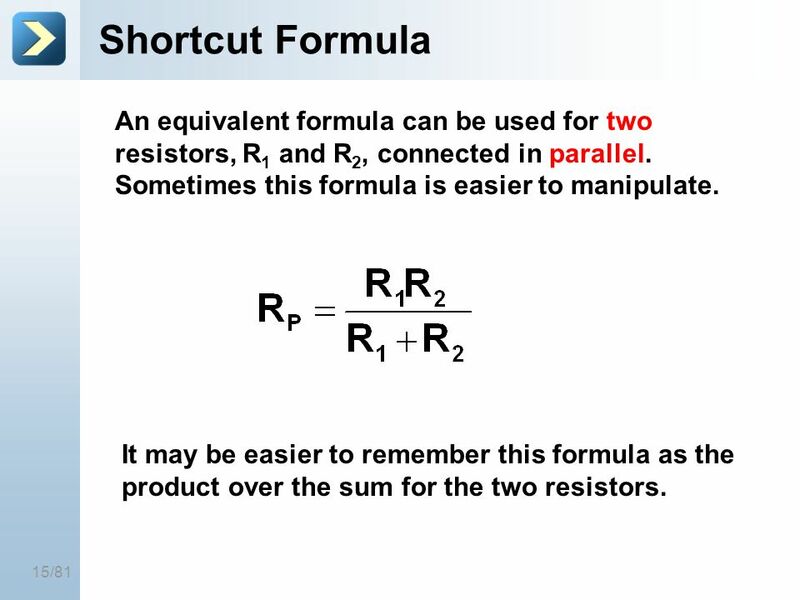 15 25-Mar-17 Shortcut Formula [Title of the course] An equivalent formula can be used for two resistors, R1 and R2, connected in parallel. Sometimes this formula is easier to manipulate. A slight variation of the parallel resistor formula can also be used for the specific case of two resistor combined in parallel. This formula may be remembered as the product divided by the sum. It may be easier to remember this formula as the product over the sum for the two resistors. Copyright © NameOfTheOrganization. All rights reserved. 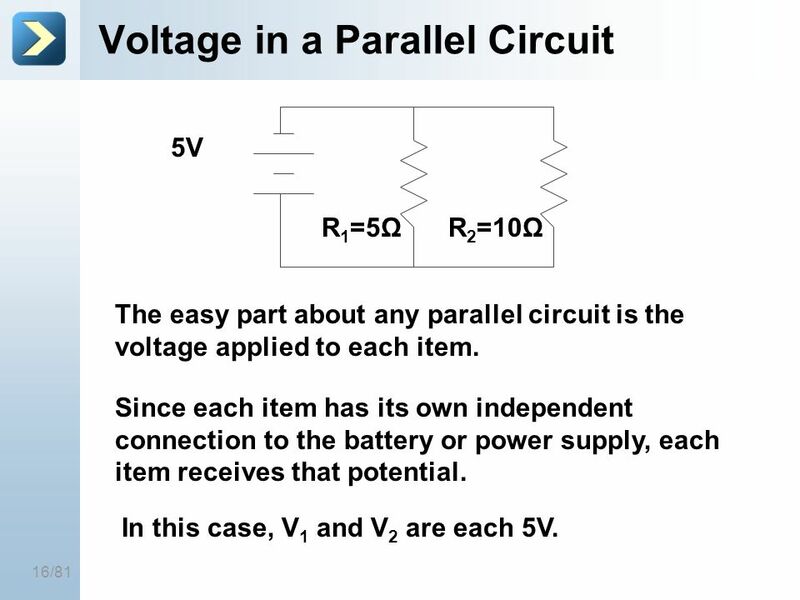 25-Mar-17 Voltage in a Parallel Circuit [Title of the course] 5V R1=5Ω R2=10Ω The easy part about any parallel circuit is the voltage applied to each item. 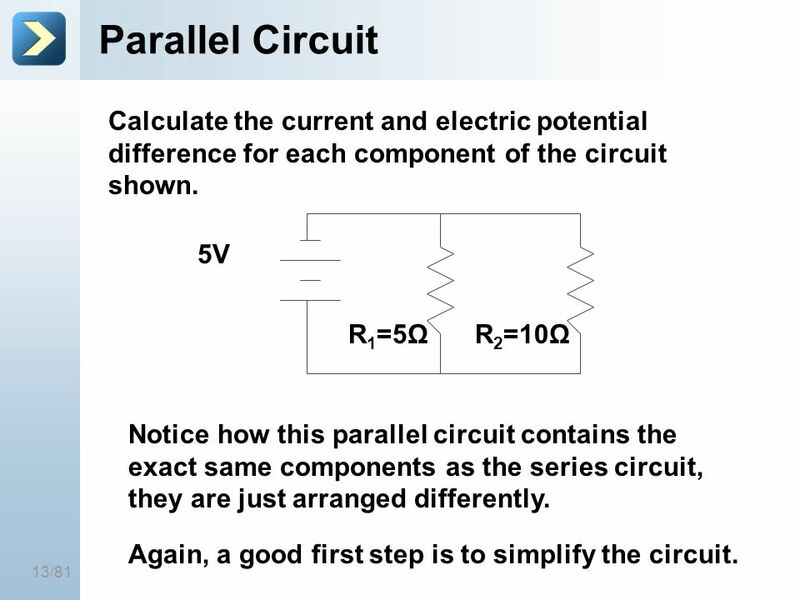 The easy part about any parallel circuit is the voltage applied to each item. Since each item has its own independent connection to the battery or power supply, each item receives that potential. In this case, V1 and V2 are each 5V. Since each item has its own independent connection to the battery or power supply, each item receives that potential. In this case, V1 and V2 are each 5V. Copyright © NameOfTheOrganization. All rights reserved. 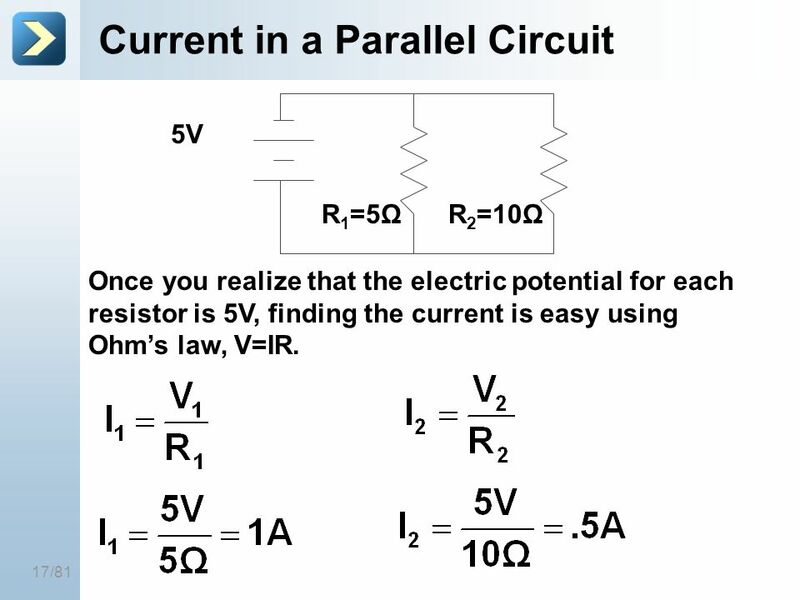 25-Mar-17 Current in a Parallel Circuit [Title of the course] 5V R1=5Ω R2=10Ω Once you realize that the electric potential for each resistor is 5V, finding the current is easy using Ohm’s law, V=IR. Copyright © NameOfTheOrganization. All rights reserved. 25-Mar-17 Current Observations [Title of the course] 5V R1=5Ω R2=10Ω Notice the two currents add up to the same value as the total current in the circuit. This is a good way to check your work. 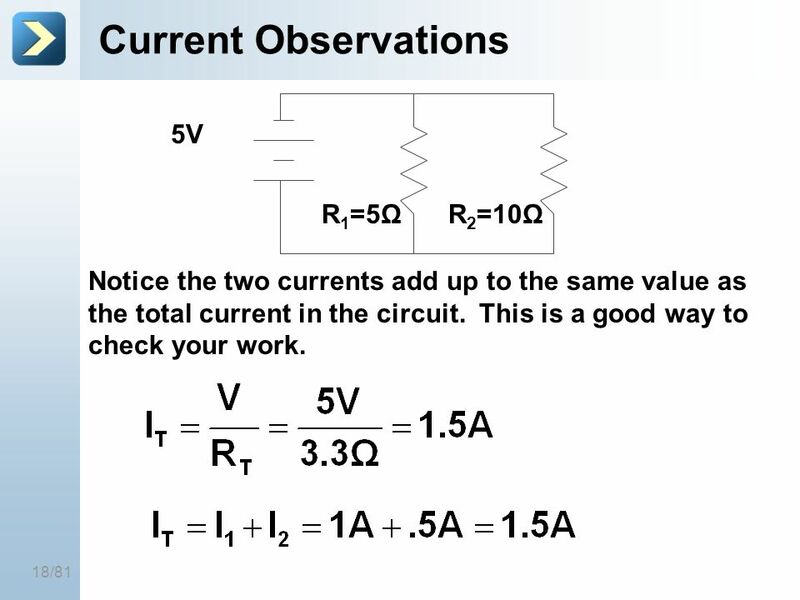 Notice the two currents add up to the same value as the total current in the circuit. This is a good way to check your work. Copyright © NameOfTheOrganization. All rights reserved. Download ppt "25-Mar-17 Circuit Examples [Title of the course]"
Ohm’s Law Objective: TSW understand the concepts of Voltage, Current, and Resistance by developing and applying Ohm’s Law. Working with Complex Circuits WORKING WITH COMPLEX CIRCUITS Physics:Electricity Jane Syltie. DC Electricity Understand the nature of electric current in terms of a moving flow of electrons. Define electric current as Coulombs per second, I=q/t. Complete Quiz You have 10 minutes to complete the quiz The Quiz is Open-Book (use it) Get help from your neighbor. I R V Voltage – Energy lost by the electrons through the circuit. Current – Number of electrons moving through the circuit. Resistance – the ability of. Circuits Chapter 35. LAB 21 What will happen to bulbs 1 and 2 when you disconnect the wires at various points? Consensus: Current requires a closed loop.